The reusable rubber moulds are a fun, economical way to make dozens of realistic scale buildings and other structures. Linka is a system of reusable rubber moulds that are used to cast interlocking plaster pieces. 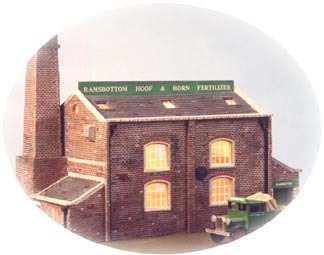 These pieces are glued together to make incredibly detailed and realistic looking HO/OO scale (1/76-1/72 or 20-22 mm) structures that resemble brick, stone, and timber buildings (see our Gallery page for examples). Although originally scaled for "British OO" (1/76), Linka moulds are ideal for scales as small as 1/87 and, with some modification, as large as 25 mm. Because the system is used to cast individual components such as windows, doors, walls, etc., it is very versatile. The pieces can be glued together in infinite combinations to make buildings of various sizes and shapes. The plaster castings are also easily cut so that the builder is not limited to the shapes of the original moulds. In the end, you are limited only by your imagination and skill. Start by mixing the plaster according to the package directions. Then carefully pour the mix into the cavities in the rubber moulds. After a brief "setting-up" time, gently flex the mould to remove the pieces. Set aside and allow them to dry completely. The castings can then be assembled into almost any type of building. Once the glued model has dried, apply the paint and weathering to create a very realistic and life-like structure. Check our Using Linka page for more detailed construction information. Linka was first produced in 1979 by Thomas Salter, Ltd. of Scotland. It was marketed throughout Europe and North America and enjoyed tremendous early successes. Poor instructions and poor market research, however, soon led to the downfall as initial sales were not followed up by repeat business. Word of mouth from the dissatisfied consumers was that Linka produced shoddy results. The meteoric rise led to an equally rapid demise and the company found itself in bankruptcy by 1983. Many new modelers quickly learned that Linka did indeed produce quality results. Sales were steady, but the market failed to grow. With enough income to remain afloat and not much else, Linka Systems ceased operations in September 1993. Stuart Manley produced a "Last Linka Newsletter" in 1995 which details the rise and fall of Linka; from its beginnings with Thomas Salter, Ltd. to its end with Linka Systems in 1993. You can read the newsletter here. What are the Linka moulds made from? The Linka moulds are made from a flexible, rubber-like plastic called Evoprene 960G. How are the moulds made? The Linka moulds are made by heating the Evoprene to the melting point and then injecting the liquid into a two-part steel die under incredibly high pressure. The moulds are made in our factory on mass-production injection molding machines. How long will the Linka moulds last? The Linka moulds will last a lifetime under normal conditions. Because of the high quality of our products, as long as you store them in a regular, climate-controlled setting (i.e., not in the attic or garage! ), the flexible Linka moulds will continue to produce the same detailed castings year-after-year. What scale are the Linka moulds? Nominally, the Linka moulds are 1/76 scale. However, because the moulds were not made to exact specifications, they work well with scales from 1/72 to 1/87. With some minor modification to the plaster castings, you can even use them for scales as large as 28mm or as small as 15mm (e.g., Flames of War scale). To use them for larger or smaller scales, simply add a row of stones to the bottom of the casting to "raise" it up to 28mm or trim the bottom row from the casting to "lower" them to 15mm. What kind of materials can I use to make my castings? You can use plaster or resin to make Linka castings. However, some resins will leech moisture from the moulds and can, over an extended period of time, lead to a degradation of the Linka moulds. This is particularly true of the more caustic, high-temperature resins. The milder, two-part resins are generally OK to use and will not degrade the moulds. For plaster, we recommend dental or stone plasters; including Herculite #2, Lightweight Hydrocal, or Excalibur plasters. We do NOT recommend Plaster of Paris (POP) as this plaster warps and shrinks as it cures making your buildings crooked and unable to line-up correctly. What if I have some other question not answered here? Just drop us an email. We're always happy to answer any questions you may have!